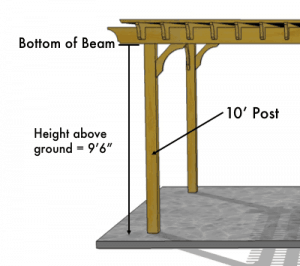 Our pergola footprint diagram lists the dimensions for freestanding pergolas and attached pergolas in sizes ranging from an 8×8 pergola kit up to a 20×20 pergola kit. 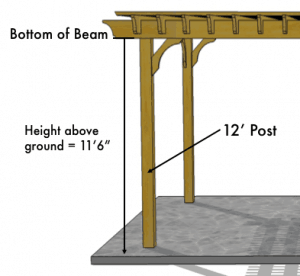 These dimensions are for our standard pergola sizes with measurements shown as Rafter Length (Projection or Depth) x Beam Length (Width). 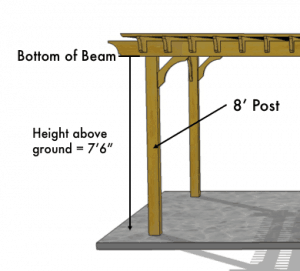 Also shown here are dimensions to consider when deciding your post lengths and desired height of your pergola. For more information about measuring for your new garden pergola kit, read through How to Measure for a Pergola, Post Information, and our FAQs, or enter your question in our Contact Us Form.